What To Watch For Tomorrow At The NCHSAA 4A State Championships! Three of the best high jumpers in the nation Addie Renner (Myers Park), Kenya Livingston (Rocky River) and Morgan Smalls (Panther Creek) will square off tomorrow afternoon. Renner has the best mark from this indoor season at 5-9.25, with Livingston at 5-7 and Smalls at 5-6. Though Livingston and Smalls haven't jumped their best this season, I'd expect their best day to be tomorrow. Both girls have exceeded 5-10 outdoors. Smalls has been playing basketball as well as indoor track, so it's hard to gauge where she's at this indoor season, but the natural talent is certainly there. 5-10 is the indoors state meet record, and that should be in jeopardy tomorrow. Three juniors will be looking to clear some high heights in the high jump tomorrow in Charles (Omar) McBride (Apex), Randolph Ross (Garner) and Idris Bernard (Mallard Creek). McBride is the top seed at 6-9 followed by Ross at 6-7. Bernard has jumped 6-6 this indoor season as well, and should be in contention. Ross is also a star in the long sprints, which could impact how high he could go if schedules conflict, though I'd say he's capable of jumping higher than he has this year. McBride has had a breakout season, and after jumping 6-9 has his eyes set on much higher marks for this weekend. 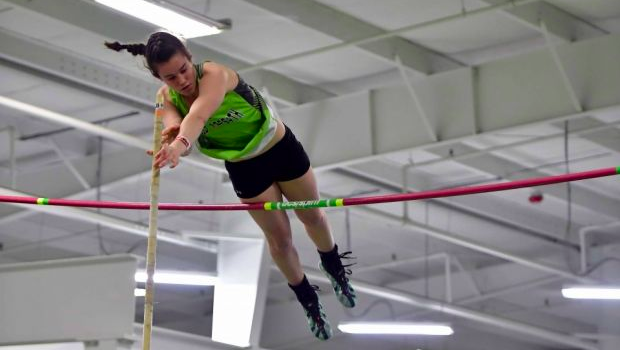 Lindsay Absher (West Forsyth) has cleared 13-0 this season, tied for NC#2 All-Time Indoors. She'll have the Overall State Meet Record in sight of 12-7 and Overall State Record of 13-1 in the back of her mind. The win won't come easy with talented vaulters of Mckenna Brunick (Leesville), Elise Hall (Leesville) and Maura Lane (Panther Creek) not too far behind her! Veronica Fraley (Wakefield) has been unstoppable this indoor season with a PR of 47-4.5. She sits at NC#3 All-Time Indoors and will look to come close to the State Meet record of 48-11.75 set by Kamorean Hayes in 2007. Fraley should be head and shoulders above his field seeded 9 feet ahead of her competition. This should be a battle between junior Chancelor Crawford (North Mecklenburg) and sophomore Mason Ellis (West Forsyth) who have thrown 57-11.25 and 56-7 respectively. I believe this is the first time they've competed head to head this indoor season, and will be the start of a rivalry the next two years in the throws.